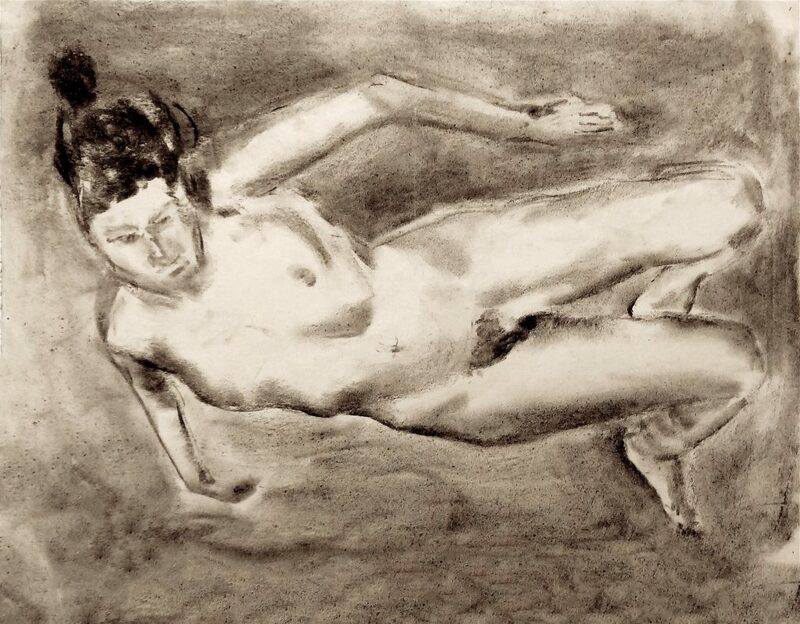 I like this floating lady, almost Chagall-like, but I don’t think she made the final cut for the exhibition which opens on Saturday at The House of Friendship, 208 High Streeet, Lewes. Forgive a few weekend musings. Germans voted for and supported Hitler. Were they mesmerised? Were good people silent, leaving “too few free spirits to do any good”? Today we continue to vote for those who have our own worst interests at heart. Even George Osborne now compares that Farage poster to Nazi propaganda. I think of carefully planned, slowly released, incitement to terrorism, in its new specificity. This is not attacking a ‘symbol’ – burning a flag, killing Lee Rigby in London simply because of his uniform, or aid workers and journalists for being ‘Western’. The terrorising murder of an important, singled-out, political actor is really different. No one death is mourned any more, nor any less, than the other. But the issue of terrorism, of terrorist behaviour, is sharply different. Gangs of arms-length thugs marauded and murdered in the dark streets of inter-war Germany. 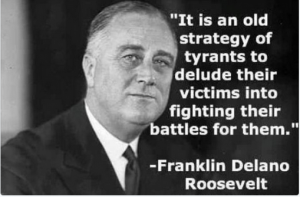 But the socialist leaders were very specifically targeted. Targeting an immigrant today is callous and totally indefensible. Targeting a prominent activist supporting immigrants is very different and far more dangerous. We cannot all copy Spartacus’ colleagues and say “I am an immigrant.” But what if – to counter Hitler’s yellow star – everyone in Britain today, who has at least one grand-parent not born in this country, would wear a sign, say a white flower, and wear it with great pride. Would that not be something wonderful? A final thought. What if on one day – the day before the referendum, for example – every single British person with one grand-parent not born in Britain declined to work that day; downed tools, refused, was on strike for Britain and humanity. Then the country would notice. Quinlan Terry has now given the Annual Anthony Dale Lecture to The Regency Society of Brighton & Hove for 2016. 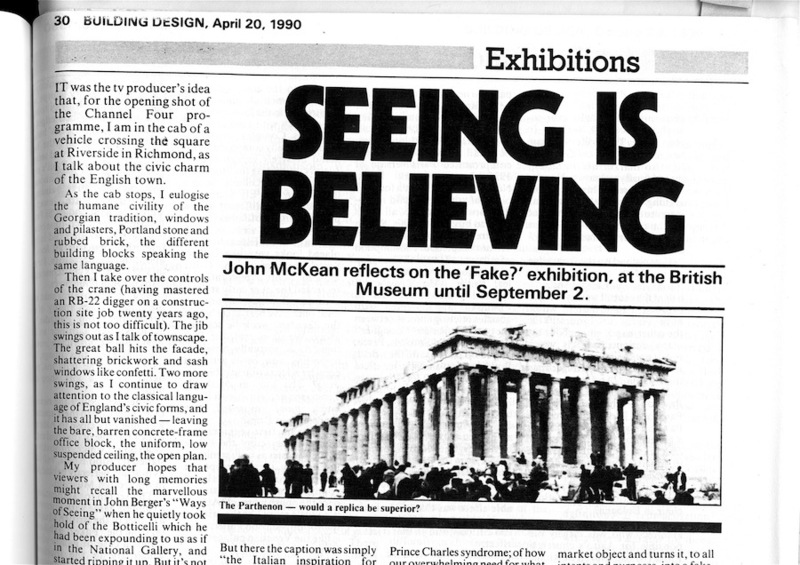 I was reminded of my review in the Architects’ Journal of almost exactly the same lecture (but without carps at Hadid et al) thirty years ago when he delivered it at the RIBA. Final preparations for the Walter Segal exhibition at the Architectural Association which opened with a packed party last night. 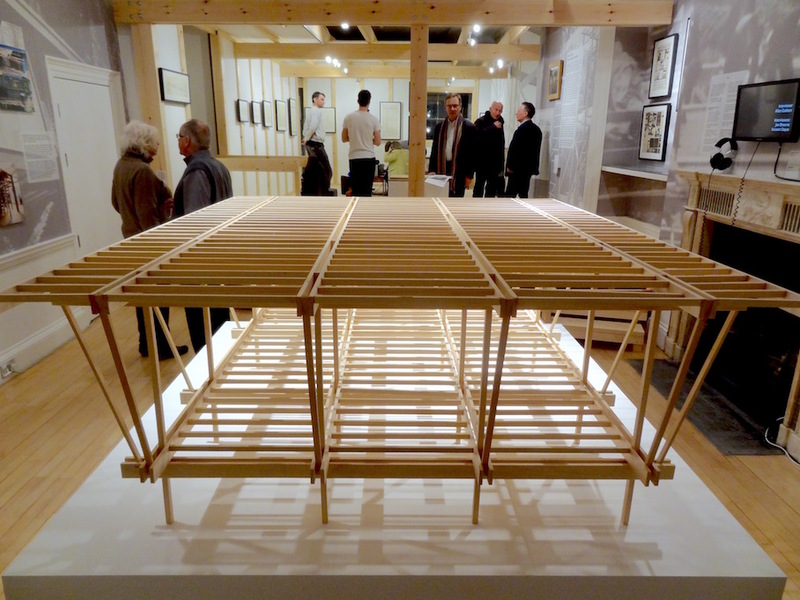 In the foreground, a “Segal” pavilion by Assemble – winners of the latest Turner Prize – which now replaces the ‘temporary little house’ Segal built in his Highgate garden. 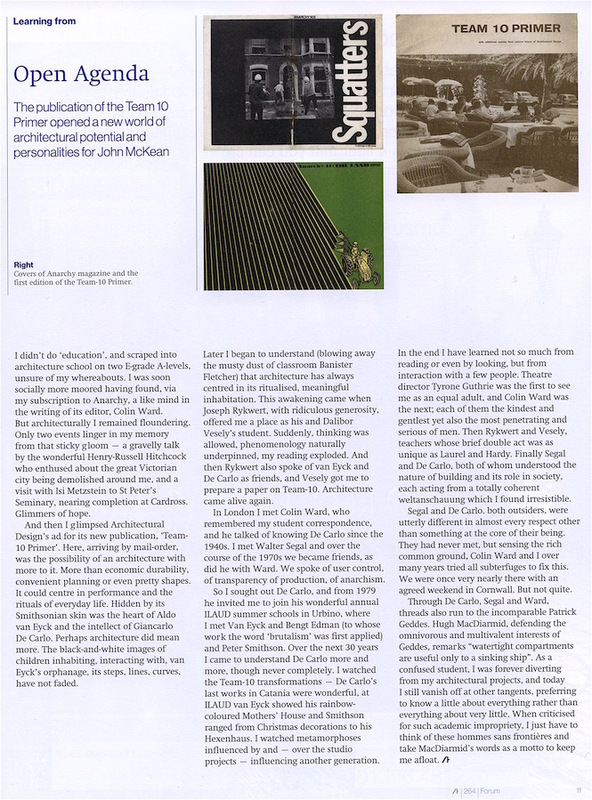 Beyond the model, to the left, are John Frazer and his wife, who built an interactive computer model of Segal’s system in 1980s to aid clients in designing themselves; to the right of the column are Jon Broome, Segal’s partner and successor with self-build; Nicholas Taylor, author of The Village in the City and, as Lewisham housing chair, the key enabler of the Segal method being taken up by a public housing authority; and John Segal, the architect’s son (seen again below portrait of Walter Segal by his father, Arthur Segal). Five minutes after this picture was taken, there was barely room to move. 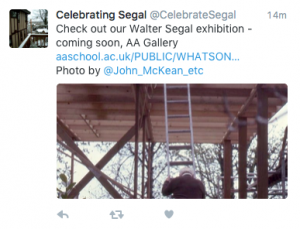 A Walter Segal exhibition is at The Architectural Association, 36 Bedford Square London, from 16th January until 13th February – more details here. I have only just learned the details myself, from this tweet. 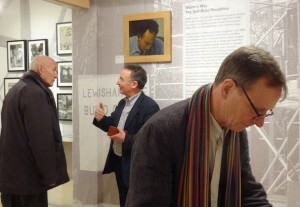 As part of that event, there is a panel discussion on Walter Segal and the Future of Self-Build, with Jon Broome (Segal’s collaborator years ago, and today a leading exemplar of timber-frame, self-build and low-energy buildings), Charlie Luxton (architect well known from regular television appearances) and Alice Graham (exhibition promoter, journalist and inhabitant of a Segal-Broome house at Walter’s Way). It will be at the Architectural Association on 26th January at 6.00 pm. 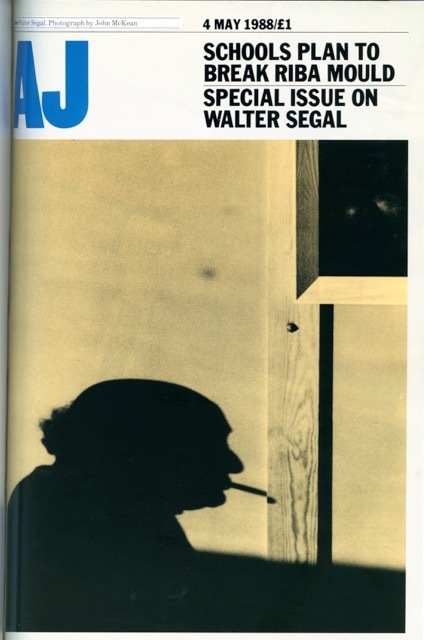 I have written much about Walter Segal, including but not only his pioneering of self-built timber-frame affordable houses for those on local authory lists as being in housing need. 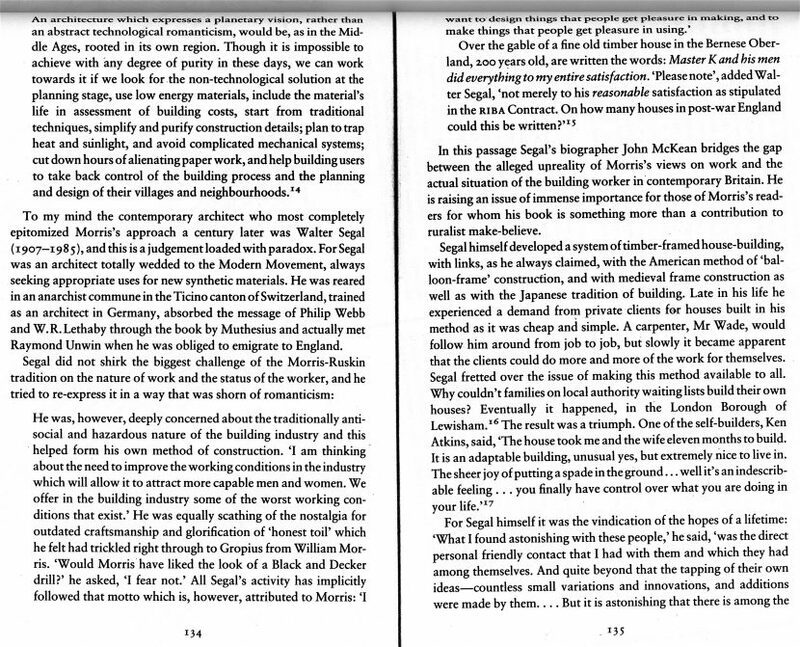 The only book on Segal is my Learning from Segal (Birkhaueser, 1989) now long out of print. 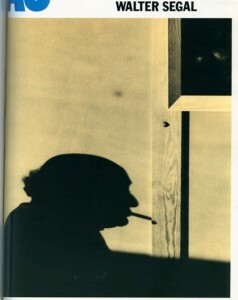 But various other writings on Segal are now available here. Currently there is simply a cupboard not properly cleared out and sorted on this website of Walter Segal stuff here. Impetus is returning and soon I hope it will be stacked with loads of accessible goodies. Meanwhile, anyone further interested – not least interested in the developing notion of using crowd funding to produce a much revised and updated of my book on Segal which is over 25 years old – do please get in touch by email.